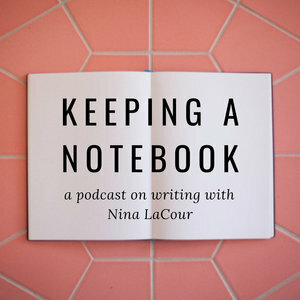 I’m not sure if you’ve missed it, but Nina LaCour, author of We Are Okay and Hold Still, has started a podcast. I had the pleasure of meeting her two years ago when she visited my school to talk about her latest novel and writing in general. She was lovely and intelligent and warm. My students – especially those who took the time to read one of her books and participate in a small group meeting – loved talking to her. I geeked out in typical Beth fashion because – duh – she’s a famous author of young adult fiction, so I hung on her every word and convinced myself we’d be friends forever. While the friendship wish didn’t pan out, I did get a Twitter follow, so I feel like that’s a win. But I digress. 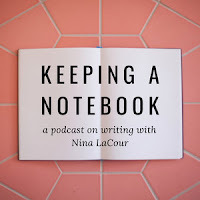 Her podcast is called Keeping a Notebook, and I’m already hooked. Each episode is short – no longer than 12 minutes - but she focuses on different aspects of writing. Her first podcast discusses how she came up with the title, and why keeping a notebook is important. Another episode discusses what to do when you feel stuck in your writing. Her voice is inviting, she includes music and sound effects, and I’ve found inspiration in each of her episodes. I’ve listened to John Green’s podcast Anthropocene as well, and while it’s not writing focused, hearing his words reminds me that even reviews of items like the Canada Goose, Diet Dr. Pepper and Super Mario Kart can be poetic. And that’s the truth. While a podcast involves listening and not reading, these authors are still writing the podcasts. You can hear the description in their stories, their careful word choice, their style. I’d never thought about a podcast as a written work before, but these authors make me look at it in a new light. I ultimately have three take-aways as I reflect on podcasts for writers. One is that writing comes in so many forms, and we shouldn’t neglect to move forward or try a different vehicle to express our voice. Another is that a podcast is an excellent promotional tool. The more I listen to Nina LaCour speak, the more I’m drawn to reading her books. And it’s lovely to hear her calm, rich voice, which helps me imagine how she might read her own novels. Lastly, we can learn a lot as writers by listening to podcasts about writing, especially if they’re hosted by talented, successful writers. She’s sparked some new ideas for me and has, in fact, inspired me to go back to keeping a notebook. No matter how you use an author's podcast, I urge you to consider them, either as a learning tool, a promotional tool, or as a way of trying something new as a writer. I love listening to writing podcasts! I'm currently digging the Write-Minded podcast with Brooke Warner and Grant Faulkner, and I listen to Writers on Writing with Barbara DeMarco-Barrett. Team member Renee turned me on to the Goal Digger podcast with Jenna Kutcher, which is about marketing, but definitely applies to writers. I just checked out Keeping a Notebook and it's on Spotify! I'm going to listen. Thanks, Beth! Beth, I absolutely love podcasts! I listen to them while I'm exercising and tidying up around the house and cooking. It's ironic though, because I don't listen to very many of the writing ones. Occasionally I listen to a podcast if I know one of favorite writers will be interviewed, though! I started out by trying to learn more about personal development and marketing, but then I got hooked on a bunch of true crime podcasts! You are right in that there is an art form to writing and producing a podcast. With the true crime podcasts, there is a script that must be produced first and it has to be written well to keep the listener's attention! Now I want to dream up my own podcast. So many ideas, so little time! I'm enjoying Keeping a Notebook!